Amethyst and Smoky Quartz with Tiffany Stone Pendant earrings, bracelet, necklace and close-up of necklace. 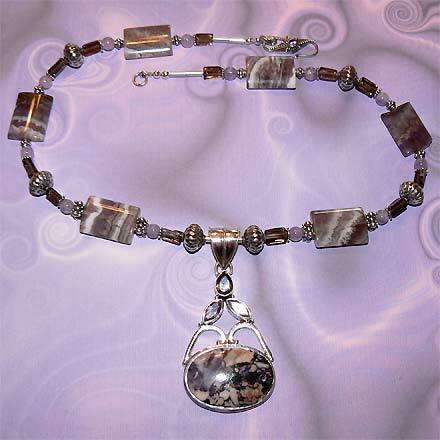 Sterling Silver Amethyst and Smoky Quartz with Tiffany Stone Pendant Necklace. 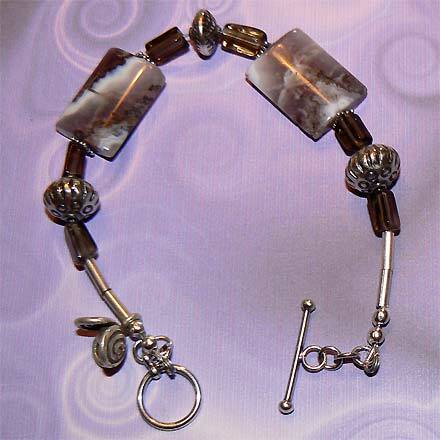 Sterling Silver Amethyst and Smoky Quartz with Tiffany Stone Pendant Bracelet. Sterling Silver Amethyst and Smoky Quartz with Tiffany Stone Pendant Earrings. 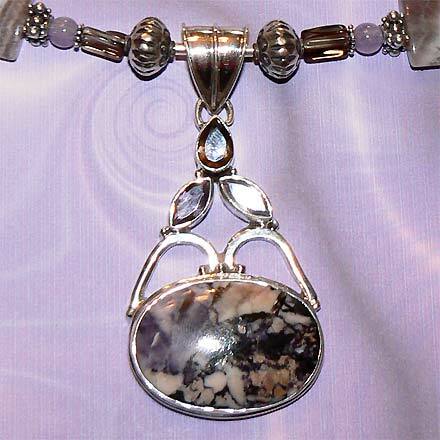 The large cabachon in the pendant on the necklace in this set is Bertrandite, also known as Opalized Fluorite. It’s commonly known as “Tiffany Stone” because its patterns are evocative of Tiffany’s ornate stained glass designs. It’s an extremely difficult stone to find, especially in bead form, so unfortunately I couldn’t find any Bertrandite beads to go along with it. I did use some lovely polished crystaline (looks like they were cut from an Amethyst geode) Amethyst stone beads (the rectangular ones) which seem to coordinate well. The necklace clasp also has a set Amethyst stone. For those who are interested in Astrological significances of stones, Amethyst corresponds with Pisces and the month of February and Smoky Quartz is associated with Sagittarius.